STAMFORD -- The great goalscorers have a knack for finding the puck. Or the puck finds them in the big moments. So in the final analysis, we shouldn't be surprised that Sean Wilkinson scored the game-winning goal as the Ridgefield High School boys ice hockey team edged Darien, 3-2 Saturday night at Terry Conners rink to capture the FCIAC Tier 1 championship. "Sean has come through in big spots all season. He's done it for us for four seasons," Ridgefield coach Sean Gallagher said. "So I'm certainly not surprised it was him." Yes, the Tigers earned their first FCIAC Tier 1 crown since 2006-07 thanks to senior Wilkinson's rebound tally with 10:38 left to play. "Our forward line (Tim Kelly, Chris Morrow, Wilkinson) have really come together. We're moving the puck well. We instinctively know where the other guys will be," Wilkinson said. "Chris Morrow took the shot and I just drove to the net. The puck came right on to my stick. I just buried it." The game-winning goal sent Wilkinson home with the game's Most Valuable Player plaque. "This plaque will look great at home," Wilkinson said. "But it's the other plaque (FCIAC Championship plaque) that's the best one of all for all the guys on the team." It was a wonderful battle between Ridgefield (20-2) and Darien (16-6). To their credit, the three-man officiating crew let the schools settle the issue on the ice as no penalties were called in the contest. Darien -- which has been wearing down opponents all season with three forward lines and three defense pairings -- ran into a Ridgefield team that could match the Blue Wave's depth. The Tigers had a lot of respect for Darien after losing 4-2 to the Blue Wave on Feb 11. "That loss to Darien got us off our high horse," Ridgefield senior co-captain Brendan Bossidy said. "It humbled us a bit." The clash was scoreless after one period as both Darien senior goalie Max Rothston (22 saves) and Ridgefield senior goalie Nathan Gliedman (25 saves) sparkled. It was 2-2 after two periods, as Ridgefield scored twice only to have Darien answer back both times. Morrow and John Christensen tallied for Ridgefield while senior co-captain Nick Bruno and sophomore Owen Koorbusch answered for Darien. 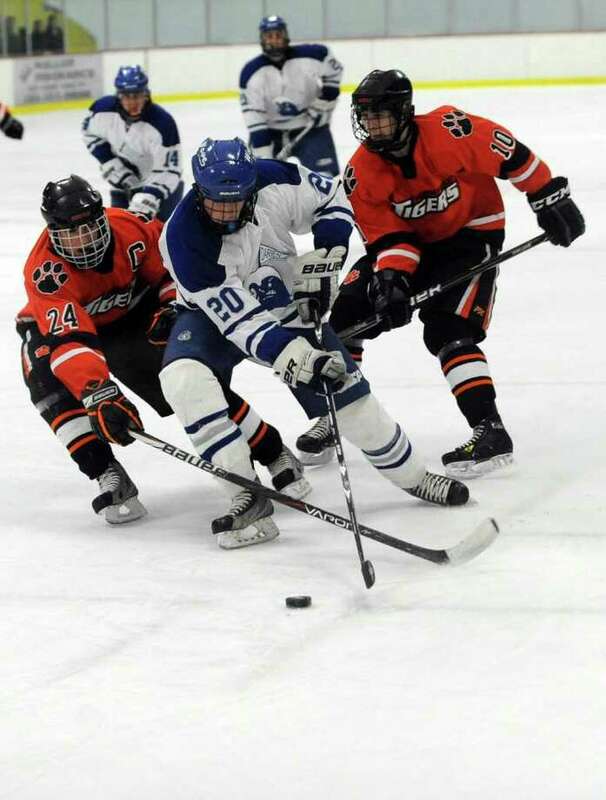 Despite not being able to employ its lethal powerplay unit, it was clear that Ridgefield had more speed than Darien. And speed killed with 10:38 to go. Kelly found Morrow on the right side. Morrow's bullet drive ricocheted off Rothston's pad to the left where Wilkinson was waiting. "That's the way the puck bounces. The puck caromed and goalscorers get to the net. Wilkinson just buried it," said Darien head coach Chris Gerwig. "It is a tough, disappointing loss. Give Ridgefield credit. They are a very good hockey team. I'm proud of the way my team fought back twice. The character of this group all season has been to answer. We had no quit tonight. We'll go back to work in the state tournament."